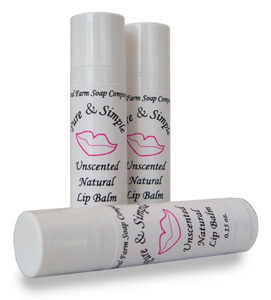 Natural Lip Balm is truly a treat for your lips! This smooth and creamy lip balm is packed with nourishing ingredients like sweet almond oil, shea butter, cocoa butter, and meadowfoam seed oil just to name a few. And, we’ve added evening primrose oil, which contains linoliec acid, said to rejuvenate skin cells. Evening primrose is full of vitamins and minerals and is an emollient. Research shows it makes the skin feel softer and smoother, reducing roughness, cracking and irritation. If you have dry or cracked lips this is just what you need to get your lips back to being kissably soft. This balm glides on smoothly and gives your lips a light gloss. Pucker up!